Describe working on Bloodlandin three words. You are working on this production with your brother, your cousin and two of your nephews. What is it like working so closely with family? We're from a big family, so when I'm working with two or three or four of them, that's nothing. This has been a chance for Stephen and I to pass down what we know to the boys [Hunter and Rhimi] and to keep them out of trouble. It's been really great; they're just so talented, and we want to let them learn as well and to not pressure them too much. We look at the boys and we see ourselves. How do you prepare your character? I try to keep in tune with the story, to know where it comes from and to concentrate on what my role is, not just as a character in a play but also as a storyteller. That's what we're employed for, to put a message across, and this play has a particularly important message. What has been the best part of working on Bloodland? It's working with this mob, this cast. We all know each other so we are working with our peers, which is quite beautiful in its way. We're creating history together, which is quite cool, and I hope it ends up being one of those plays that ends up coming back, and other artists can play those characters, and the story can continue. The company made a trip to the NT prior to starting rehearsals on Bloodland. What did you learn from this visit? I've been up there many times so I know that, like the city, there are problems everywhere. You can't gloss over it but you have to wonder what you can do to help it. It was great for all of us to go up there and to bond by grabbing the guts of the story. It was a big eye opener for a lot of people who hadn't been there before. Doing this play is a way for us to give back to that community. 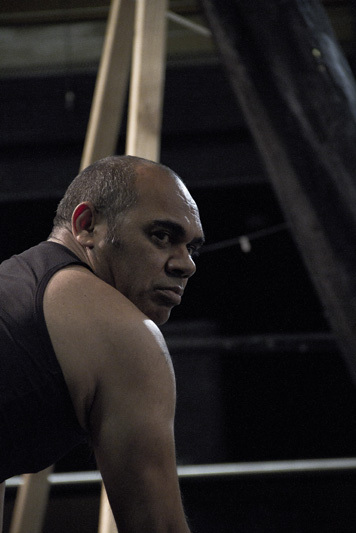 What is it like performing a show in an indigenous (Yolngu) language? Stephen has a beautiful way of communicating through dance without using any dialogue, so with Aboriginal language he has been able to find a way to put across the meaning so you can understand it, and we throw in some English words to support the understanding. It's sometimes embarrassing, though, because there are people in the show who are fluent and I've just learned it. Sometimes I accidentally come out with some naughty words they tell me "You can't say it like that", which is pretty funny. Do you have a favourite scene or moment in the show? The last scene is exceptionally beautiful, it's incredibly touching. You'll cry. We all do. What do you think the experience of watching Bloodlandwill be like for the audience? They're going to love it. It depends where you're from and how broadminded you are. Everyone's different and we're not going to please them all. Some people will want to be spoon-fed the story, so this won't suit them but others want theatre to be an experience. I think those people are going to be blown away. Bloodland, Wharf 1, until 13 November, 2011.